Having a blog on your website is a great way to boost your site’s SEO, but only if you take the time to post to it on a regular basis. In fact, many experts recommend posting at least once a week. But for many of us, that is a steep assignment as life and the daily needs of running a business can get in the way of blogging. For others, it might not be the time involved for blogging so much as having ideas for the posts. If you fall into this latter category, then you are not alone. Write Away Copywriting has some ideas and tips for your next blog posts. Be informed of the latest changes, new products, etc. in your industry so you can share that information with your readers. Lessons learned about running your business are not only inspiring but lets others know that they can overcome obstacle, too. It also lends some credibility to you and your business. Ongoing saga of what is going on at your company. Do you have a new product or service? Perhaps you have hired a new sales rep or expanded your service area. Letting your readers know what is going on helps them connect and builds loyalty. Goals you are working towards also lets people know where your company is headed. Surveys are a great way to get customer feedback or to ask leaders in your field for their input. Consider posting pictures with names and companies of the survey contributors, as way to boost link opportunities, as well. Blog posts are a fun way to generate interest and excitement about what is happening at your company. They don’t have to be long, technical diatribes, just something that keeps site guests engaged and wanting to hire you or use your products. 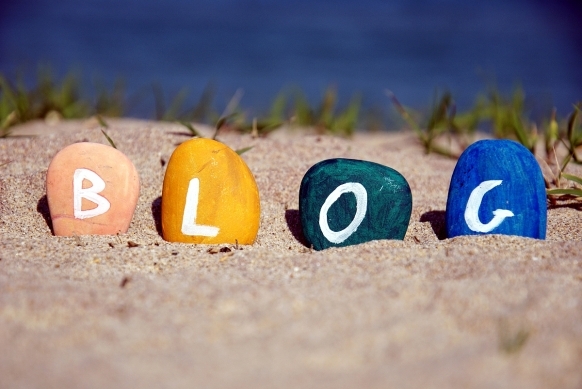 So, don’t let that blog page sit empty…write a blog post this week! A mother brought her young son to the optometrist because he had complained that he could not see everything that was written on the blackboard. The child is an excellent reader, so the doctor opted to use the traditional alphabet-based eye chart. The doctor pointed to one of the smaller rows and asked the boy if he could read it. The boy replied, “No, Sir.” The doctor then pointed to a row with larger letters, and again asked, “Can you read this?” The little boy again answered, “No, Sir.” As the doctor moved up the chart, the little boy said that, no, he could not read the row. Finally, the doctor reached the second row from the top– the one just below the big “E” – and once again, the little boy replied that he could not read it. Conclusion: Be sure the words you use convey the message you want the recipients to receive. Writing for the Web is no different. You have to not only use your company’s keywords, but you need to use then often enough –without overdoing it – to be noticed by the search engines but without forgetting that you are writing for people. After all, keywords are not just important to your Website content, but if you wish to be found on the Web, you need to use them as part of your social media updates, PPC campaigns, landing pages and blog posts. However, not every company specializes in writing for the Web (also known as Search Engine Optimization) or has time to learn the nuances of SEO writing. As a result, their online presence suffers. This is where NC copywriting professional, Write Away Copy Writing is there to help. Whether it is through providing SEO rich Web content, making weekly/daily social media posts, writing company newsletters or providing keyword rich blog posts, Write Away Copywriting would love to help you get found on the Web. Contact J. Slagell, your NC SEO copywriter today to learn how the words you use for your business can be incorporated into website and social media posts so that your intended recipients are getting the message you want them to receive. In the world of online businesses and SEO Content Writing, “Content is king.” This is because having new web content on a regular basis allows search engines to know that your website is alive. However, writing content takes time and when you run your own business you may not have the time to devote to writing. So, to build brand awareness along with increasing search engine ranking, many website owners opt to hire content writers to provide web content. But how do you know which content writer to choose? After all, there are thousands of web content providers available, each with their own style of Content Writing. What to look for in a good SEO content writer? The Content Writer should be a self-starter. Doing web Content Writing is not for the faint of spirit. It requires taking the time to research the topic thoroughly and then provide SEO friendly content that appeals to the client as well as the reader. A competent content writer will provide the work on time and not require babysitting along the way. The SEO Content provider should be organized. When you are talking to someone about Content Writing be sure to ask how they approach writing content. Do they use a writing checklist, a calendar or task organizer? Perhaps, the Content Writing company has a team of specialists where jobs are divided up based on skill sets. The more you know about the writing development phase the more at ease you can be in hiring a specific Content Writing company for a job. Does the potential Content Writer understand the various types of web Content Writing? An effective content writer knows how marketing writing differs from navigational writing, as well as how to write good descriptions, SEO friendly titles and paragraphs that are informative yet interesting to read. The SEO writer is able to not only provide web Content Writing but can edit, as well. This is especially helpful if your company frequently re-designs websites where the site owner wants you to take the existing web content and give it a new look. Does the web Content Writing provider submit nearly flawless (preferably, error-free) work? Despite living in an age where texting and three letter acronyms are common, writing issues like misspellings, typos, improper subject-verb agreement, poor grammar and slang should not be a part of a properly executed Content Writing. When corresponding with a content writer pay attention to how they write. If there is a plethora of problems in their e-mails, chances are their written content will reflect the same. These are some of the most important traits for a SEO Writing provider. After all, effectively composed Content Writing can make the difference in the success of your web business. Content is king, but if the Content Writing reflects the mind of the jester rather than the elegance of royalty, your web content may do more harm than good. Be sure to hire a Content Writing provider whose work successfully promotes your company! In days gone by, if you wanted to advertise your business, it was necessary to spend large amounts of money on printed ads, signs, and media. And, while much of that still holds true today, these are no longer the standard in advertising. The newcomer to the advertising world is the internet. After all, many people are so busy with work, school, family, sports, etc. that spending hours at the store shopping for just the right items is time they don’t have. To counteract that, the wise service provider is including on-line shopping, customer reviews and coupons, all available at the click of the mouse. Consequently, one of the best ways to make sure that your website ranks high on a web search is through the use of Search Engine Optimization (SEO). By definition SEO is “The process of improving the volume or quality of traffic to a web site from search engines via “natural” or un-paid search results as opposed to search engine marketing (SEM) which deals with paid inclusion.” Ideally, you want your website to rank high on the list generated by web searches so that you will have more “hits” on your site. There are several methods that allow a copywriter to decide what the best words/phrases are to ensure high placement on this list. When you decide to upgrade (or build) your website, you will want to be sure that the content writer understands search engine optimization and will be employing SEO as part of their writing. When it comes to the actual content of your webpage you can either supply the copywriter with the basic information you want posted and have them insert/edit it to meet search engine optimization needs or you can simply provide the ideas/products to be discussed and ask the copywriter to do the research. Depending on the method chosen, the copywriter will then begin writing your webpage content. If you opt to have the copywriter do the research, they will employ a variety of research methods ranging from the use of books and magazines, interviews, polls and web sources. Of course, the more work the copywriter has to put into the research and writing process, the more it is likely to cost. Taking time to explain the needs of your webpage is important. Be sure that your copywriter understands what you are looking to accomplish. This will result in web content that is more pleasing as well as more SEO friendly.